Charles Woodson. Provided by National Football Foundation. 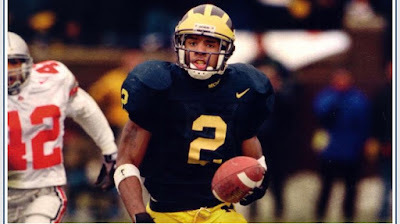 The National Football Foundation (NFF) & College Hall of Fame announced on today's telecast of Sunday NFL Countdown on ESPN that Charles Woodson, the All-America defensive back at Michigan from 1995-97, will be a member of the 2018 College Football Hall of Fame Class. Woodson, who currently works as an NFL analyst on the ESPN show, was surprised by the program's host Sam Ponder, who handed him a commemorative football provided by the NFF to mark the announcement. The NFF broke the news during the show to generate advanced excitement for tomorrow's announcement of the entire 2018 Class, which will take place during SportsCenter on ESPN between 9:30 and 10 a.m. EST live on set at Mercedes-Benz Stadium in Atlanta, Ga.
A two-time First Team All-American, Woodson earned unanimous honors after his remarkable 1997 season - the same year he claimed the Heisman, Walter Camp Award, Bronko Nagurski Trophy, Chuck Bednarik Award and Jim Thorpe Award. His versatility was on full display that season as he finished second nationally with eight interceptions while also scoring as a rusher, receiver and punt returner. The two-time Big Ten Defensive Player of the Year led the Wolverines to the 1997 conference title after a win against archrival Ohio State in which he scored on a 78-yard punt return, intercepted a pass in the end zone and caught a 37-yard pass for Michigan's only offensive touchdown. Woodson and the Wolverines would wrap up their perfect 12-0 national championship season with a win over Washington State in the Rose Bowl, in which he recorded an interception and tied for a then-Rose Bowl record with four passes broken up. Active in the community, he established the Charles Woodson Foundation, which offers scholarships to students raised in single-parent homes, and he has contributed millions of dollars to the University of Michigan C.S. Mott Children's Hospital for pediatric research. A member of the Walter Camp All-Century Team, the Big Ten renamed its defensive player of the year award as the Nagurski-Woodson Award in his honor in 2011. He has served as a broadcaster for ESPN's Sunday NFL Countdown and Monday Night Countdown since 2016. While each nominee's football achievements in college are of prime consideration, his post-football record as a citizen is also weighed. He must have proven himself worthy as a citizen, carrying the ideals of football forward into his relations with his community and his fellow man, with love of his country. Consideration may also be given for academic honors and whether or not the candidate earned a college degree.